I like languages, mountains, art, puzzles, and old, dusty books. 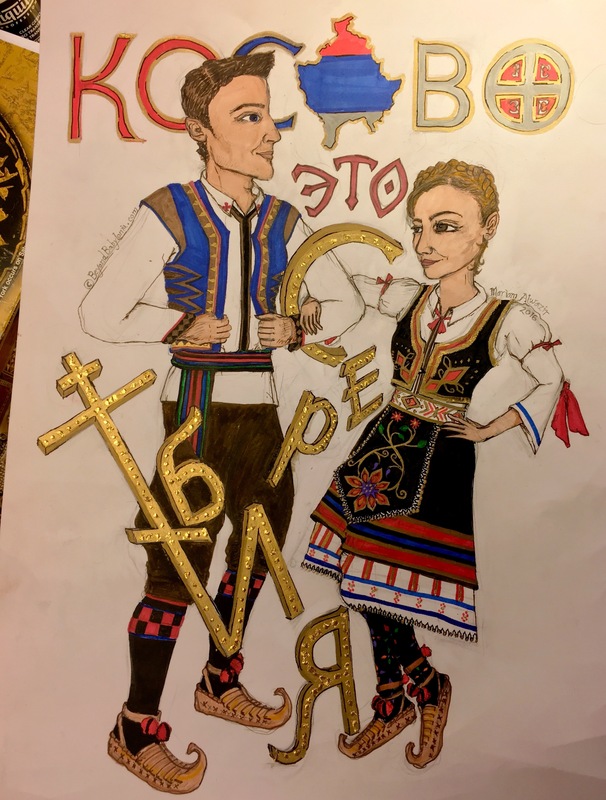 Shato brikhto (Happy New Year of 2019)! I am excited to share a new design piece of mine — a visual expression of the Assyrian capital, Nineveh. I also detail some of my research, design process, and other musings in this post. Nineveh is part of a lettering & illustration series I am working on, which carries a heavy emphasis on architecture and archaeology of each city I explore and design on. I hope to discuss this cityscape series in a future post. But if you’re curious right now, please take a look at my Vibes of Sana’a project, which was the first design of this series. So without further ado . . . I composed Nineveh in four different forms, but in three different scripts: (1) Cuneiform, (2, 3) Syriac, and (4) Arabic. Scripts from top to bottom: Cuneiform, Syriac (Classical), Syriac (Eastern), and Arabic. I arranged these scripts in that order chronologically. The oldest language that would have been used in the Nineveh during ancient times lies at the top, which is Old Assyrian. The most recent language used by the inhabitants of this region lies at the bottom, which is Arabic (Iraqi dialect). Cuneiform, Syriac, and Arabic = ASSYRIA! Let’s start from the top — Cuneiform. There are many versions of Cuneiform syllabaries. Different dialects and writing systems of Cuneiform evolved from the different regions within Mesopotamia (Assyria versus Babylonia). There are also differences of Cuneiform due to the different time periods spanning its usage, such as Old Assyrian (OA), Neo-Assyrian (NA), Old Babylonian (OB), and Neo-Babylonian (NB). There are clay tablets containing a mix of languages and dialects of Cuneiform (Sumerian mixed with Akkadian), and there are tablets containing a mix of ideograms and syllabaries (writing systems shifted over time). The variant of Cuneiform I decided to choose to represent the name “Nineveh” is the Old Assyrian version. It took me a long while to research all the various Cunei-forms (heh) that can spell out “Nineveh”. So I really hope the ideograms or syllables I used in this illustration is accurate. If you are a linguist or Assyriologist and believe I made a mistake, I would appreciate you letting me know. The more I learn, the more I realise how much I still have to learn. Below the Cuneiform, we have “Nineveh” written in the Estrangela Syriac script — the oldest written form of Syriac. Underneath Estrangela, we have the Madnhaya Syriac script (Chaldean or Nestorian) used by the eastern Assyrians. 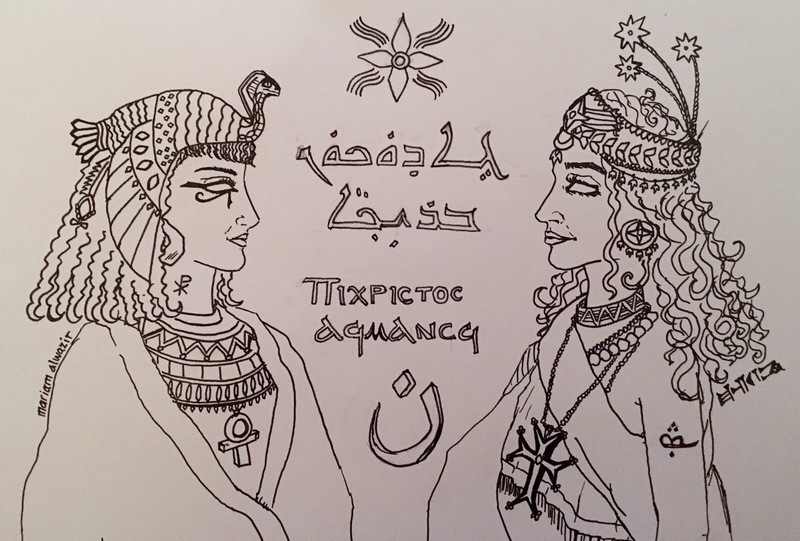 As I created this, I debated on whether to include an additional Syriac script in this piece. Serta (Maronite or Jacobite), was spoken and written by western Assyrians, in dialects like Turoyo. 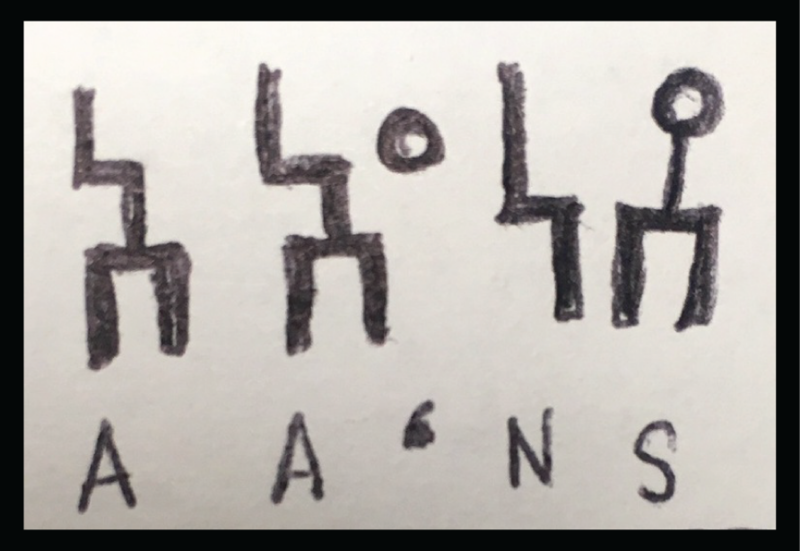 I felt, though, that including this third Syriac script would be inaccurate to represent Nineveh, as that script is more associated with western regions of the historic Assyria, such as in Tur Abdin (in modern day Turkey). So I left Serta out; however, I will happily include it in customized versions of this piece. Arabic: Finally, we have Arabic at the very bottom. Although Arabic is the dominant language of Iraq and Syria today, it is not the official language of the Assyrian nation. With the illustration, I aimed for a rustic look, somewhere between abstract and realism. I sketched two Lamassu (Lamassi?) on the foreground of either side of the design. The Assyrian “tree of life” stands in the background. Protruding from the tree are branches that twist and turn, and finish off with flowering leaves, in depictions of it on the Old Assyrian tablets and reliefs. The branches become one with the four languages of lettering I included, as they share a similar form. I wanted to really make this tree intricate and to hide the scripts within the branches to evoke mystery . . . but later I decided that my work and its meaning would become lost. Versions of a “sacred tree” or “tree of life” are quite universal in cultures beyond Babylon, and can be seen in Old Norse literature all the way to Mayan and Aztec works of art. I started this piece in January 2018, while I was at my old job in the firm. I liked staying a little late to take advantage of the silence, the bright lighting, and large desks in the office (all features of which I lacked at home), as escapees from the office plunged themselves into heavy traffic. As always, my art work begins with anger. I was angry at several events that happened in areas of Syria and Iraq that we sentient and sensitive citizens of Earth have no control over. I needed to find a release somewhere, so I converted my negative emotions into creative energy. It started with a pencil lamassu sketch, based off a cell phone picture from Met. Museum in NY. Why couldn’t these colossal entities come to life and protect inhabitants of Assyria? 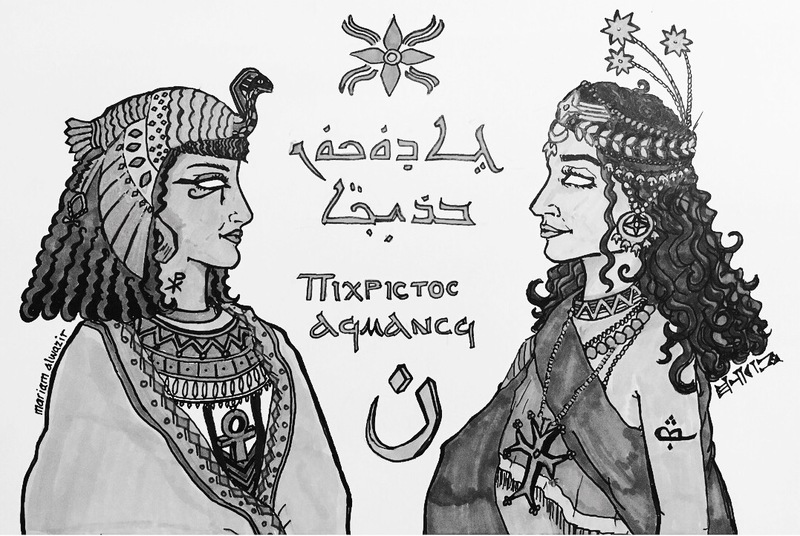 Then I realized I could borrow the concept from my Sana’aa multi-lingual lettering design for a new piece featuring Nineveh, the lamassus, and . . . the Assyrian tree of life! 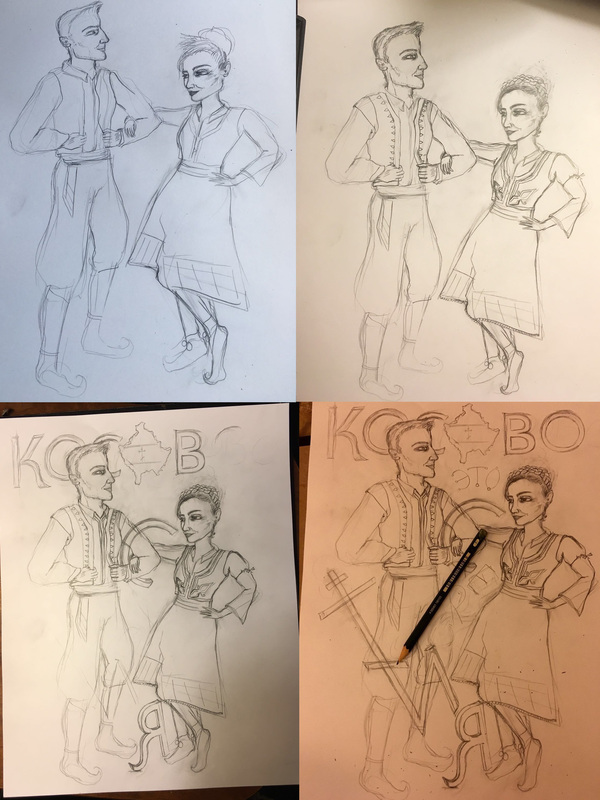 I made two separate pencil sketches before digitally erasing my sloppiness, connecting missing lines, and completely reworking other areas in the design. Then I researched an appropriate colour palette. Assyrian and Babylonian art is often depicted with lots of neutral browns with a pop from lapis lazuli blue and gold. Sketching, sketching, sketching . . .
Take a look at a map of the Middle East, and you will not see a country labeled “Assyria”, nor will her borders be distinguished. Assyria is a region of the Middle East that covers eastern Syria, northern Iraq, and bits of southern Turkey and westernmost parts of Iran. In these four modern-day nations, there are ancient Assyrian ruins throughout, as well as contemporary Assyrian villages and cities. There was a time where Assyria was not only a vague territory or region, or a country even — she was an Empire. Her capital stood at Nineveh, near the modern Iraqi city of Mosul. After the fall of Nineveh in 612 BCE, Assyria ceased to be an Empire, though her many towns remained. Her languages survived. Her people survived and are still living today. And her culture survived. Nineveh has been through so much Arabisation since the spread of Islam across the Near East, as Arabic is the sacred language of the Holy Qur’an. 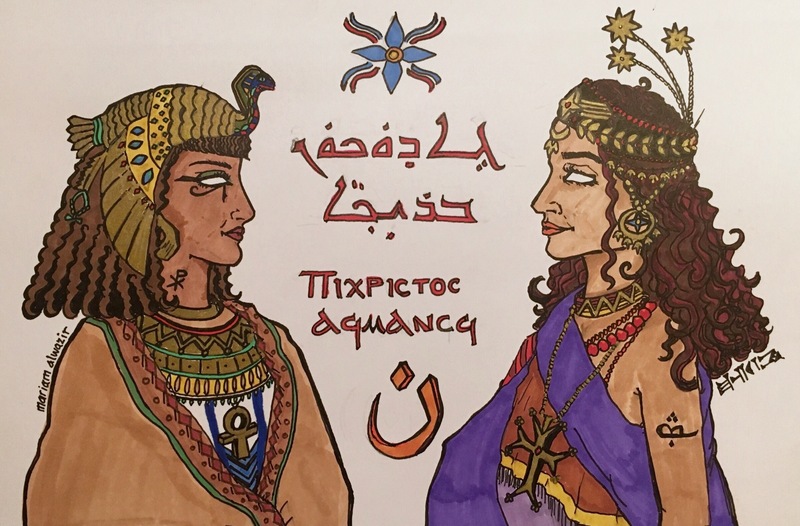 Over the centuries, Assyrians have picked up on what quickly became the dominant language, but remained a people without an official autonomy. Assyria has been through far worse than just linguistic and cultural demise, though. Seyfo, which comes from the Arabic word sayf for ‘sabre’, was the genocide of the Christian populations that occurred during WWI by Ottoman troops between 1914-1920. 100 years later, today, we see even more atrocities being committed by ISIL/Da’esh whom are all anti- Muslim, Christian, Yazidi, Zoroastrian, Jewish, and Pagan. It’s sickening. It makes me sick that there is far too little that I, or anyone else, can do about these human rights violations to have an effect. Only few governments have the power to run the world’s affairs. At this point, can all we do is keep the memory alive? or sustain it? or can we make what is a declining culture rise again and become an influence in the Middle East? We cannot let the dark forces allow societies in the Middle East to just tolerate one another’s existence and to “pray” for one another, but celebrate the diversity and richness within our homes and have open discussions for learning. I would like to share a work of calligraphy I made in the winter of 2014. Here I have Surat al Ikhlas in what was intended to be Kufic Arabic script. 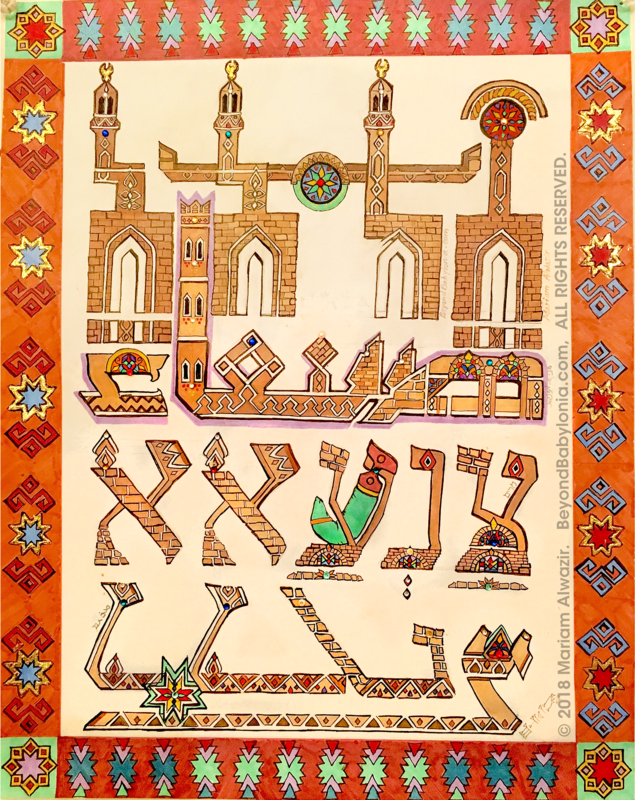 Kufic, the oldest form of Arabic script that emerged from borrowing elements of the Nabatean and Syriac abjads, traditionally excludes the i’jam. I’jam, the dots that you see on the Arabic letters, is seen in modern Arabic script to help distinguish some consonants from other consonants. I decided to add the i’jam dots, and also softened the traditional Kufic edginess of the letterforms. I suppose we can classify this piece as Kufesque. I composed the entire Sura in a curved manner so it could hang beside a rounded mirror in an aesthetic fashion. Oh, before I get carried away: Sura is the Arabic word for “chapter”, but specifically refers to a chapter in the Qur’an. Ikhlaṣ is Arabic for “purity” or “sincerity”, and is derived from the root X-L-Ṣ (khaliṣ: sincere, loyal; pure). I initially sketched this on a notebook during a weekend of my last semester of college. 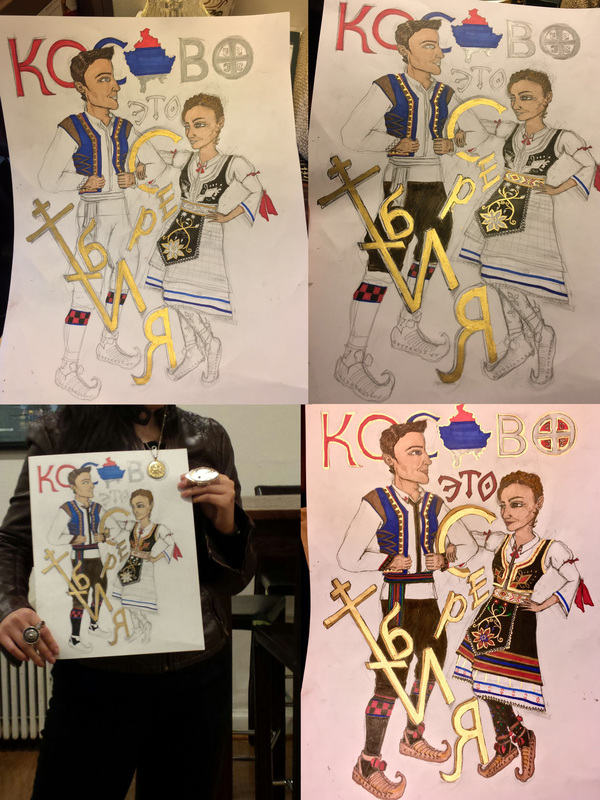 It took me two months to decide to turn the sketch into a proper piece (I was a full time student, and this was but a leisure activity for me). After I turned in my thesis, finished my internship, and graduated, I took another good look at what I created in Arabic, and then decided . . . hey, why not in Hebrew as well?! The ontological and concise nature of this Sura is appealing, and not just from an Islamic or a religious perspective. Many monotheists, whether religious, secular, or agnostic, may find the message of this Sura to be one they can relate to. This Sura is especially relatable to some one of the Jewish faith, as one of the shared foundations between Islam and Judaism is: “Lam yeled wa lem youled”. In other words, our main idea of the nature of Allah/YH*WH (swt) is the same. For that reason, I decided to work on a Hebrew version of Suratal Ikhlas as a way to bridge the two religions of Islam and Judaism closer together and to promote the fact that humanity lies beneath the same Creator. 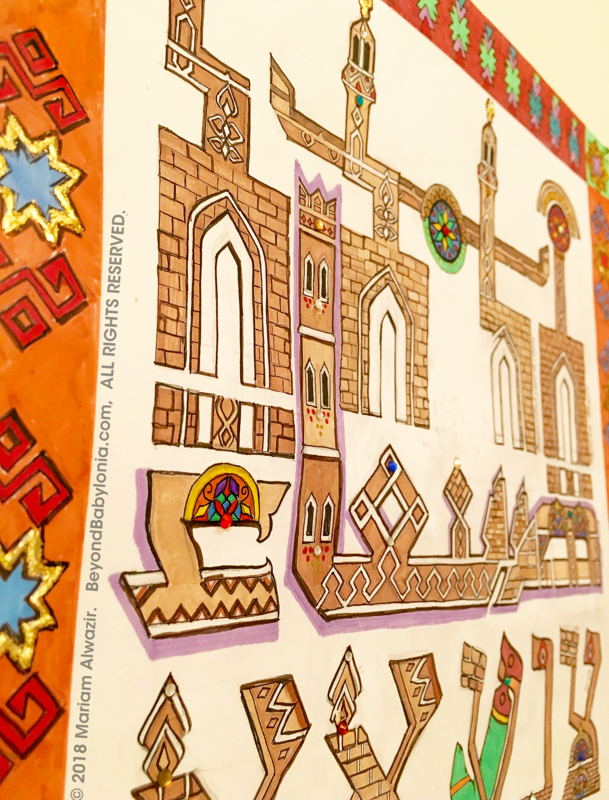 I found the translation from Arabic to Hebrew, and practiced a bit with composition. I allowed the text to spiral from upper-right corner, inwards, to create a circle. In geometric symbolism, circles are shapes that mark divinity and absoluteness, while squares symbolize our mortality and the material world, as the four-points of a square symbolise one ending and another beginning (in contrast to the ‘unending’ form of a circle). 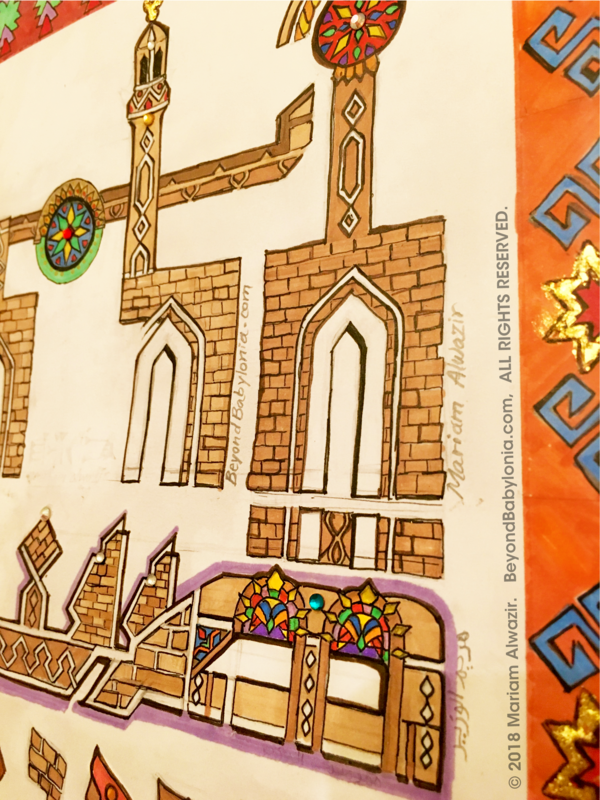 Next time you find yourself in a mosque or temple/synagogue, look above at the domes, windows, mosaics, and other polygon shapes that dominate the architecture. When you visualise an octagon, you can see how it lies mid-way between a circle and a square. In other words, such polygons lie between this world and the celestial realm. That is why domes and arches in sacred buildings are often imperfect/angular circles—because of the symbolism associated with polygons as straddling between the material hemisphere and spiritual hemisphere. To learn more about sacred geometry and mathematical elements found in nature, I highly recommend The Logic of Architecture: Design, Computation, and Cognition by William Mitchell. I also found the extremely different forms of the two scripts quite fun to play with — Arabic is a very linear script, whilst Hebrew is very squarish and blocky. So, I thought it would be an additionally interesting contrast to have the blocky forms of Hebrew composed in a round layout, as I already had the Arabic version in a curved layout. 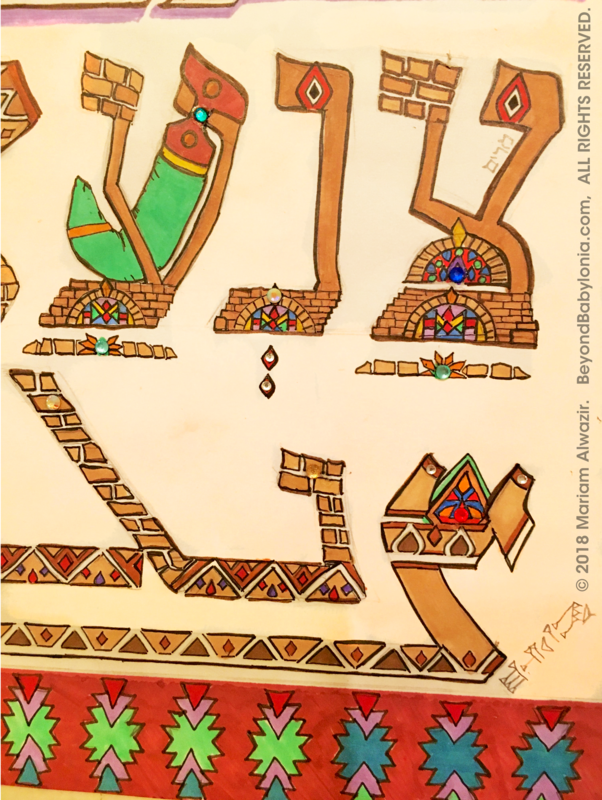 The words “Elohim” (later changed to “Eloqim”, upon the request of my Sephardic friend*), and “YH*WH” (occurring twice) in this draft were inked with gold leaf. The “-im” suffix of Eloqim is the plural form of Eloh (Eloh=Allah). However, do remember that the “-im” suggests the Royal We of the Divine, and not the idea that G-D is in multiple parts. One last thing to point out, is that Allah, Arabic for “G-d”, can be rendered as YH*WH (in Hebrew) when flipped upside down. If you are familiar with both Arabic and Hebrew scripts (btw that makes you awesome), I encourage you to use your imagination. Start with the lower-right corner YH*WH. Since the spiral makes the Hebrew script on that side upside-down, you can easily see how the Hebrew YH*WH can be read as “Allah” in Arabic (the ה read upside down form the letters ا and ل in Arabic). 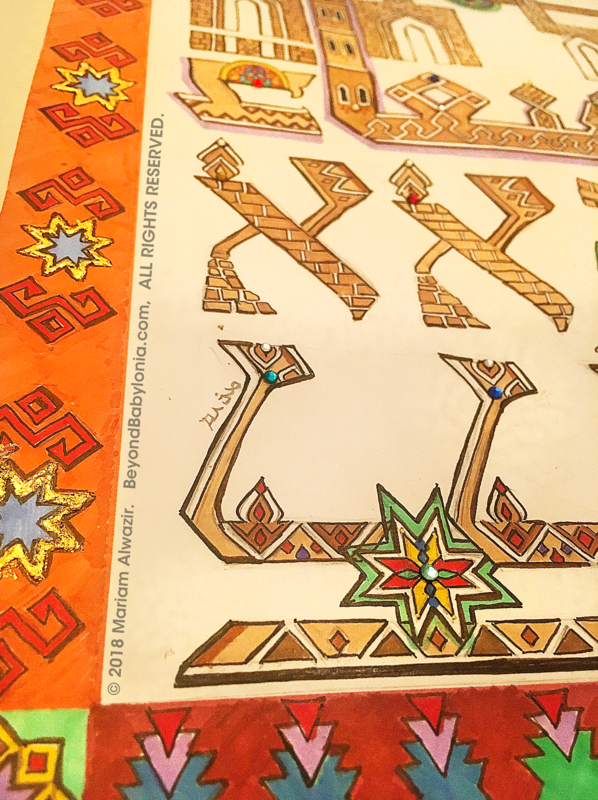 Basically, we tweeked the Hebrew letterforms just a bit, so that when flipped upside down, it resembles the Arabic letterform for Allah. The bar at the top of the ה was stretched out so that it could resemble the linked letters of the word الله. Indeed we are all one, under the same One Creator, whether Allah or YH*WH. To be able to write His name once, in a way that is legible in two languages, is reflective of that unifying view. Although the calligraphy designs are my own work, I cannot take credit for Allah-YH*WH being shown in such a unifying way. Years ago, I found an old kabbalah article online that dissected the word YH*WH and discussed the symbolic attributes of the letters. Then there was an image shown with the word “Allah” beside YH*WH to show how similar the forms are. I tried finding the creative mind who came up with this, but it didn’t look like he was even credited in the article. 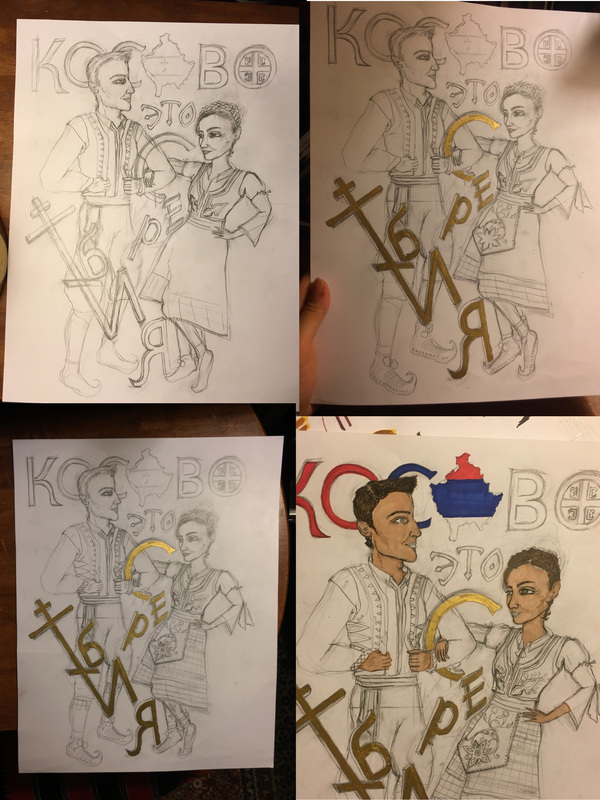 If I ever find this person, I will link them on this post 🙂 Also, the final version of the Hebrew calligraphy piece in blue ink is no longer in my possession (it was a gift to said Sephardic friend), but I hope to remake a similar one soon. * Many conservative Jewish people refrain from writing our G-D’s name or having His name (his? its?) in written form in their homes. Materials Used: Winsor and Newton acrylic ink, applied with rusty calligraphy pens on Bristol paper. I wish all my Coptic and Assyrian brothers and sisters a blessed and peaceful holiday. I wish for a peaceful and glorious era for the Middle East (and the world) in the near future. I have updated my Epic of Gilgamesh page with more recent sketches. However, if you find my sketches to be lacking in colour and excitement, you might consider checking out the newest addition to my portfolio; Persephone and Zephyrus will redirect you to the appropriate page!